Add your favorite music to your videos in any way you want! Choose a part of the video where you would like to add a song. Supports song mixing with the original Video sound. Isn’t this awesome! + Repeat mode support: If the video is larger than the music, you can choose to repeat the audio till the end. Also you can disable the repeat mode and keep the original background music / audio till the end of the video. 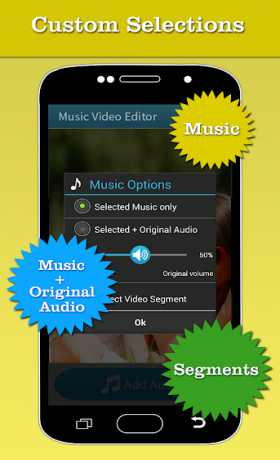 + Choose the start location of the background music – you can just add your favourite part of the songs to your videos. + Audio Editing at its best: Choose the location/position in the video where you want to add the audio. Say you have a Video /movie of 10 minute length and a 4 minute song – so, you can decide to add the background music /song/audio from the 4th minute to say the 6th minute of the movie. App trims /cut the portion of the audio and it will be inserted in the background like an audio editor. + Volume control with Audio Mixing – You can choose whether to keep only the added audio/songs volume OR a mix of song / music and original. You can decide the level of mixing i.e. songs volume high and original audio volume low etc. It is like a Voice Over feature. + Preview support: Before saving, exporting the video/ movie, you can preview the output with newly inserted background audio and then decide whether you want to keep added one or make some changes in the sound i.e. edit again. + Video List support: Generated , exported videos, movies are kept in a video list for your easy reference. + Share support: Share your Music videos & movie creations on Facebook, Instagram, YouTube, by email and much more! Unleash your imagination! 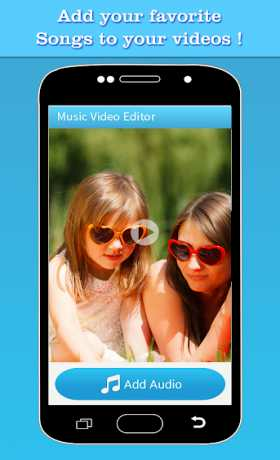 Start creating masterpiece Music Videos by mixing, inserting background Music / Sound! You can also use it for video dubbing – if you have a dubbing file, you can use it as input for video dubbing. Support Volume control with voice over. Best in class Audio Video Maker & Editor. App is completely FREE!!! App uses FFmpeg under permission of LGPL.